This is exactly the source of policy-induced wealth inequality in the modern advanced economies: the disparity between labor income tax and capital gains tax that (1) incentivises accumulation of capital gains generating assets; (2) increases wealth inequality arising from non-meritocratic transfers (spousal and inheritance); and (3) reduces gains from meritocratic investment in human capital. 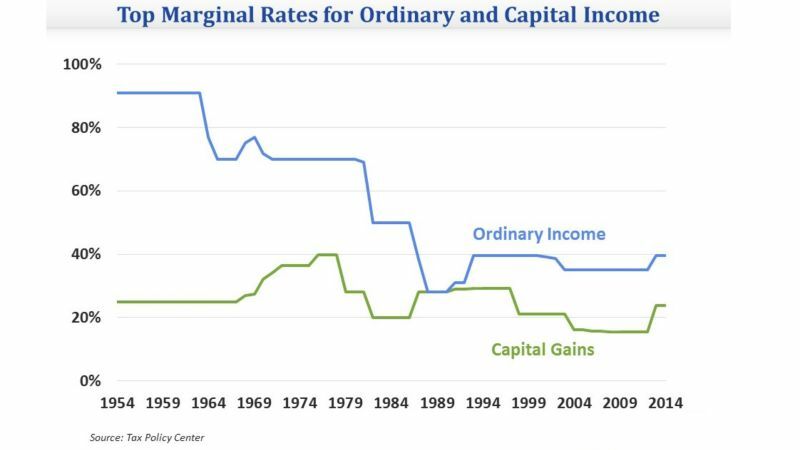 Now, factor this into tax-adjusted returns on various forms of capital: Intangible Capital returns are taxed at a corporate tax level at below the Physical Capital returns tax rates, which fall lower than the Capital Gains tax rate. Meanwhile, returns to the [intangible] Human Capital are taxed at the rates of higher margin Income tax rates. Go figure why wealth inequality is rising (as entrepreneurship is shrinking). ← Where Will You Be Seated at the Banquet of Consequences?